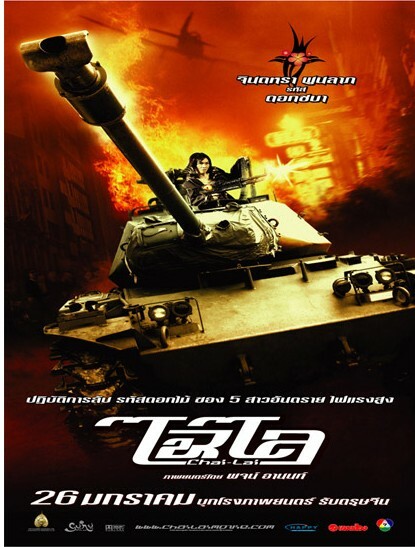 In 2006 Director was Poj Arnon was asked to make a film by Sahamongkol group.It's base should be like the Hollywood hit Charlies Angels but with a Thai twist . Not only did they make the film they even more or less copied the title.The film evolves around five top secret agents who must stop a criminal ring from aquiring the Mysterious Pearl of Andaman ,ontop of that the criminals have kidnapped the child of the one man that knows the whereabouts of the pearl. The chai Lai's are given the go ahead to solve the case and protect Miki the kidnapped child (played by Child actress Narawan Techaratanaprasert who starred in Somtum and Power Kids 5). They recieve there orders from their boss or Handler as implied here (played by Petchtai Wongkamlao of Ong Bak and Tom Yum Goong). From fights on a Plane to car chases ,tank battles and a fight in a massage parlour where our Angels have a fight while dressed only in Towels ,the fight spills out in to the streets along with King Kong getting in on the action . The action scenes are well done ,same can not be said for the fighting ,though a lot better then American films of the 80's or early 90's.The best scene ,though wire assisted was the fight with child star Narawan Techaratanaprasert and it was only a small scene. It would have been great if we could have had some Ong Bak / Born to fight style fighting ,but our actresses /actors where just that and not fighters. Even though i did enjoy the movie ,but it's hard not to with scantily clad Thai girls running around being super heroes.I would have like to have seen Petchtai Wongkamlao in more scenes asi think he's the funniest man in Thai cinema ( Check out 'Bodyguard 1&2). With not a over long running time the ending came swiftly ,nearly rushed. But as a light hearted action fest with out much to think about ,this is quite enjoyable with a few mates and a beer or 10.